When it comes to 3-point field goals, the Clackamas Community College women's basketball team is not shy about letting shots fly from beyond the arc. The Cougars were at it again on Wednesday, running both hot and cold from long distance as they knocked down 9 of 30 treys in an 82-72 Northwest Athletic Conference win over Clark College at Clackamas CC's Randall Hall in Oregon City. Sophomore guard C.J. Buckley led all scorers with a career-high 31 points on 11-for-19 shooting from the field with five 3-pointers as the Cougars (8-7, 4-2 South) won for the second time in three games. Miranda Jensen added 11 points off the Clackamas bench and Landy Williams finished with eight points and a team-high 10 rebounds for the Cougars, who jumped out to a 24-14 lead at the end of the first quarter and never looked back. "I don't think we played our best, but overall I think that we played hard and we did what we needed to do in order to win," said Buckley, who scored 18 of her 31 points in the first half. 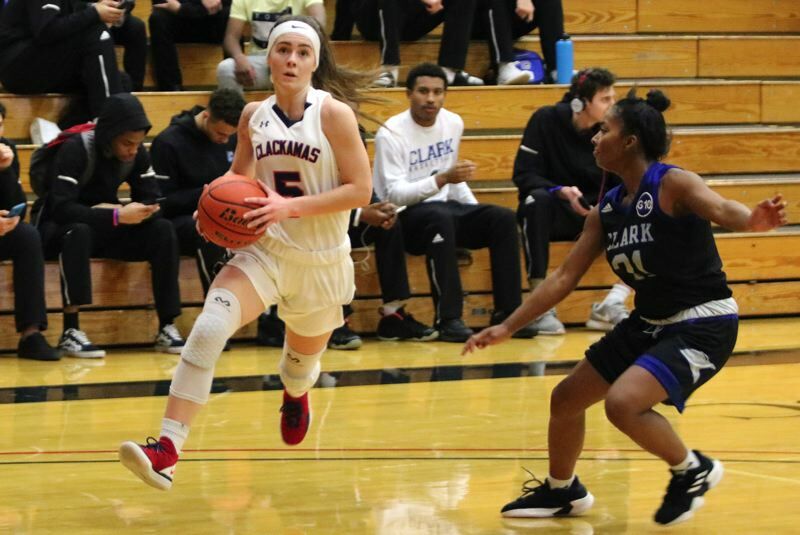 Clackamas missed its first six shots from the field and then caught fire, closing the first quarter on a 24-10 run that saw the Cougars shoot a blistering 60 percent (9 for 15) from the field with four 3-pointers -- two from Buckley, one from Paige Downer, and another from Ambreece Gaskins. Leading 43-31 at halftime, the Cougars pulled away in the second half behind Buckley, who hit her fifth 3-pointer to push the lead to 62-47 with 1:25 to play in the third quarter and then added two free throws to extend the advantage to 72-53 with 7:43 left in the fourth. "Obviously, C.J. got hot and shot the ball well tonight," Cougars coach Jim Martineau said. "When she can make five out of 10 from the 3-point line and still get to the rim like she does, she's a tough match-up." For the game, Clackamas shot 43.8 percent (28 for 64) from the field and 30 percent (9 for 30) from beyond the arc. Thirty 3-point attempts might seem like a lot for some teams, but not Clackamas. In recent years, the Cougars have typically been "guard heavy" and Martineau has tailored his offensive philosophy accordingly. Through 15 games, the Cougars are averaging an NWAC-high 29 3-point attempts per game and rank fifth among South Region teams in 3-point field goal percentage, shooting 30.3 percent (132 for 435) from beyond the arc. "I wish we were a little more consistent," Martineau said. "Tonight, we went 4 of 10 in the first quarter from the 3-point line, and then we backed it up with 1 of 10 in the second quarter. Then we go 4 of 6 in the third quarter, and then 0 of 4 in the fourth, but that's women's basketball and it's been that way for 22 years. It's a streaky game." The Cougars look to Savannah Duarte, the 6-foot-1 freshman from Clackamas High School, and Williams, the 6-foot freshman out of Mazama High in Klamath Falls, to anchor the low post, even though neither one is a "true" post player. "Savannah's best game is shooting free-throw line jump shots, and Landy is really good at catching the ball at the elbow and rippin' and getting to the rim," Martineau said. "But neither of them are back-to-the-basket posts, so we're playing a whole year without a real post-up game. "So, we try to make it a guard game where we try to get to the rim, but in order to do that, you've got to be willing to shoot 3-pointers, otherwise everybody is just going to pack it in on you." The game plan is not to just run down the court and jack up the first open shot from 3-point range, although sometimes it may look that way. "What we're trying to do is get the guard with the ball to the paint," Martineau said. "If we can't get a quick lay-up, we'll kick the ball out and shoot in transition. But we want to at least get a paint touch as we come down the floor and try to explore a lay-up." Gaskins, the 5-4 freshman from Salinas, Calif., is the Cougars' most-prolific 3-point shooter on the season, having made 37 of 123 shots from beyond the arc. Buckley has knocked down 28 of 92, followed by Jensen (20 of 61), Paige Downer (12 of 50), Peyton Elliott (10 of 44), and Duarte (10 of 30). "I love playing that style, especially this year because I've gotten better at shooting 3-pointers," said Buckley, the former Century High School standout who went from shooting 23.5 percent from long range as a freshman to shooting 30.4 percent from distance this season. She's also the team's leading scorer, averaging 19.1 points a game. "I think Jim just likes having girls who can shoot," Buckley said. "He's pretty confident in our team with every single player shooting a 3-pointer. And I think most of the plays we run are for in-and-out, 3-point shots, so I think that's just one of his go-tos." Again, that doesn't mean the Cougars are running down the floor thinking, "3, 3, 3," even though it often looked that way Wednesday against the Penguins (3-14, 1-5). "A lot depends on what defense the other team is running," Buckley said. "When they're in a zone like Clark was for most of the night tonight, we're going to run specific plays to get open 3-pointers, so I think that's why we shot so many tonight." And as long as the Cougars are shooting 31 or 32 percent from beyond the arc, Martineau will encourage his players to continue dialing it up from long distance on a regular basis. Said Martineau: "Everyone tells you 33 percent is the numbers, because it's like shooting 50 percent from 2-point range, which is pretty accurate -- two out of six 3-pointers gets you six points just like three out of six lay-ups. But I've always been a believer that if you shoot above 30 percent from distance and you can get up 30 shots a night, then you can be alright. "The problem is, if you go 9 for 30 from distance and then you go 12 for 34 from inside the paint, it's going to be a long night. But we've been much better at finishing around the rim this year than we have in years past, and that helps make it work."